DiSH lab blog » Blog Archive » Congratulations to Dr. Jenna Cummings, who successfully defended her dissertation! 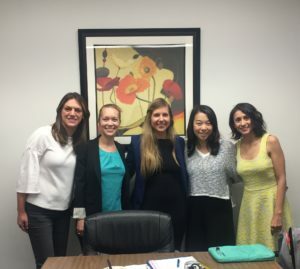 This past Friday, Jenna (who is the last of our trio of grad students who will be leaving us this year) officially became Dr. Jenna Cummings! She successfully defended her dissertation, titled “Leveraging Rewards to Reduce Health-Compromising Behavior”, earning her Ph.D. This is a huge milestone in Dr. Cummings’ career, and we are all incredibly proud to call her one of our own! She accepted a post-doctoral position at the University of Michigan, where she will be working with Dr. Ashley Gearhardt. We wish her the best and can’t want to see what she does in the future!